Lady and the Blog → Personal Blog → Getting Excited About BlogHer 2011! Getting Excited About BlogHer 2011! I woke up this morning actually feeling half human again. This sickness knocked my socks off, but thankfully I didnt have a fever. It was just a nasty head cold. My kids have both run off to camp and Bill is at Starbucks so I thought I’d use these few quiet moments to get some quick work done before crawling back in bed to help speed up my healing process. Did I mention I lost 3 pounds this weekend? There should be a book about the sickness diet… just saying – it works better than any hard cover I’ve read. While checking my emails, I’m noticing a lot of chatter about BlogHer. I’m starting to get invited to parties and I’ve made a list to keep track of them all. My partner in crime, Audrey McClelland, and I have booked our hotel and flights and are ready to rock and roll!! We’ve been asked to go to BlogHer with CVS as party of their Beauty Club team. Now, if you know anything about me and my crazy addictions – you know I am utterly OBSESSED with CVS. I guess all that talk about using coupons at their store made enough noise for them to notice me. And now I’m going to BlogHer under their name. I could SCREAM!!! Anyway, are you going to BlogHer by chance? It’s in a few weeks! San Diego here I come!!! You and Audrey are two beautiful additions to the CVS Beauty Club team 😀 Hope to run into you there! BTW, the #blogher11 chatter is starting to blow up BIG time. Three weeks and counting! That’s awesome that you’re going to BlogHer with CVS’ Beauty Team! I’m honored to be sponsored by Bumble Bee Foods again this year. Busy Mom and I were just talking on Google + the other day about how few special events we’ve been invited to, we were thinking maybe there weren’t any. The only thing I’ve been invited to is a screening of the movie The Help with a reception after, but it’s at 5:00 on Sat. during the closing keynote, so I haven’t decided. I’d sure love to get more invites 🙂 See you there I hope, in the crowd of 3000! Im going to The Help!! So I will see you THERE!!! Exciting! I’m always up for anything that gets me on an airplane! 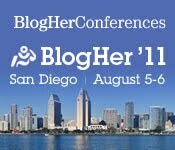 I’ll be at BlogHer for the first time! No sponsor though …What does the CVS Beauty Club team have up their sleeve? I dont know yet! Cant wait to find out! !